Department of Electronics and Communication Engineering was established in the year 1993, with an intake of 60 students. The department has produced several university ranks including University first rank in the year 2004. The students intake of UG was increased to 120 in the year 2005. To promote higher education, a Post graduate Programme M.E (Applied Electronics) was started in the same year. In 2013 the Dept. has stared another PG degree Programme M.E., in the discipline of Communication Systems. The department also offers Research Programme. Electronics and Communication Engineering (ECE) is a swiftly advancing field, with new ideas emerging every other second. From mobile phones to fiber optics and remote sensing, there are exciting avenues to explore and create. The ECE department at St.Peters University prepares students for careers in this constantly evolving discipline, pursue leadership, technical, and management positions in a variety of industries Students have obtained placements at leading companies. Some are pursuing their higher studies in prestigious institutions in India and abroad.The ECE Department holds national and international conferences that function like informal think tanks. Faculty and students benefit from guest lectures on the latest innovations in both established and emerging fields. Campus interviews are conducted every year by leading software and hardware companies. 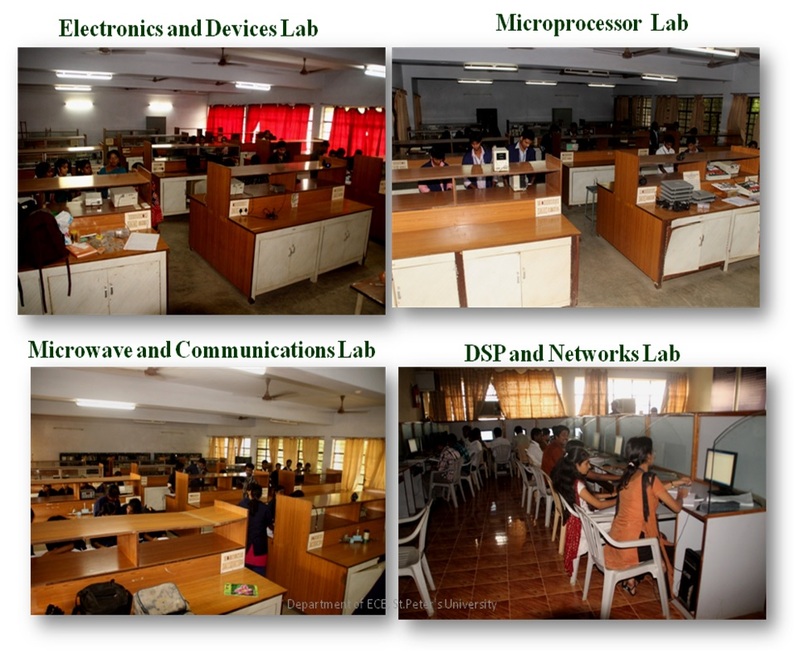 The department has got well equipped Laboratories and Computer facilities along with high speed Internetwork. The Department of Electronics and Communication Engineering is currently the best destination for the dream of the students with highly qualified faculty and the state of art laboratories. It is one of the established and largest departments in the institution. The department aims at creating quality engineers with sound technical knowledge and awareness of the latest advancements in existing and emerging technologies. In all courses the department has built an excellent reputation for its graduates in terms of placements. Our faculty brings state-of-the-art research, development, and design experience into the classroom, ensuring that our students and alumni are able to apply for registration as professional engineers in all part of global engineering and the scientific community. The faculty and students of ECE are continuously engaged in the relentless endeavor to improve upon past performance and to uplift the position among the league of engineering institutions. Seminars, Conferences, Project Expo, and symposia were organized by the department for initiating research in young minds. Students were encouraged by giving seed money for the best ideas do their project. 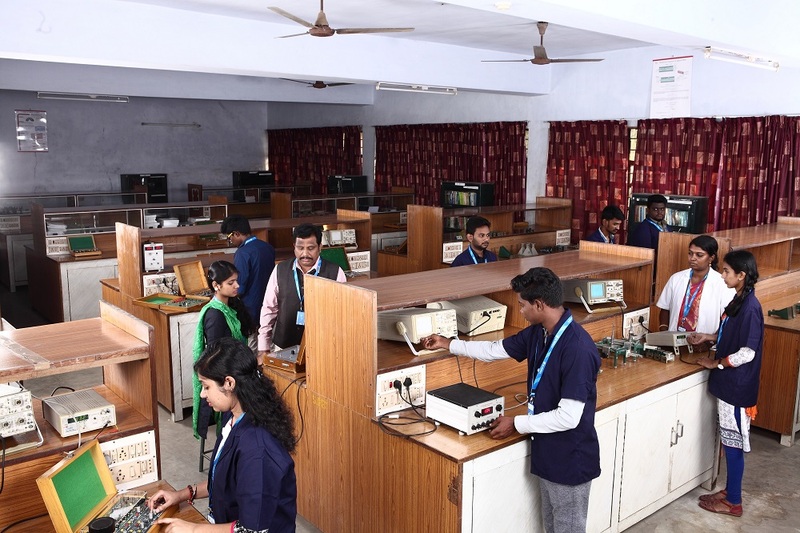 The Electronics and communication Engineering has always enjoyed a respectable status among the major recruiters in India and the excellent performance of its students across the industry has enabled the department to maintain its strong brand image. Presently, the research students are working in the areas of Adhoc Network, Optical Network, Bio-Medical Signal Processing, Medical Image Processing, VLSI Architecture etc. The Department has more industrial collaborations with industries which provide opportunities for students to get good exposure in hardware design. Communication is the fastest growing segment of the industry and has been experiencing exponential growth over the last decade. This programme is an advanced level course in the field of Communication Engineering offering a specialization in terms of technology and applications to fulfill the requirements of the industry. This programme makes the students out-rival in both hardware design and communication software design. It deals with an application of communication engineering principles based on a solid foundation in signal processing, baseband and band pass communication signal design, radiation systems, electromagnetic, wireless and optical media challenges for transmission and networking and high frequency processing circuits, to solve engineering problems and to address the technological challenges of the future communication needs. Our campus is witnessing an exponential growth in R&D activities. Apart from a large consultancy work undertaken by our Electronics and communication Engineering department, Academic research gains its momentum day by day. Nearly 30 research scholars are undergoing their Ph.D in various fields in Electronics and communication engineering. Young faculty members pursuing doctoral degree are offered a seed money to start their research and also stipend is given for full time Research scholars. Papers have been published by our faculty members and research scholars in different refereed journals of international and national repute. Research papers have been presented in various conferences, seminars and symposia held at national and international levels. Our Department has signed MOUs with industries and institutions to promote collaborative research and consultancies. MOU has been signed with Pantech Prolabs India Pvt . Ltd. Technologies on 14th July 2017 for the benefits of research programmes and Research Scholars with the collaboration of Research and Development Units. MOU has been signed with Vee Eee Technologies on 19th January 2017 for the benefits of research programmes with the collaboration of Research and Development Units. MOU has been signed with National Institute of wind Energy on 15th June 2015 for the benefits of research programmes and Research Scholars with the collaboration of Autonomous government R&D Institution under MNRE. MOU has been signed with Waveguide Technologies on 19th February 2015 for the benefits of research programmes and Research Scholars with the collaboration of Research and Development Units. MOU has been signed with Chase Technologies on 9th August 2014 for the benefits of research programmes and Research Scholars with the collaboration of Research and Development Units. MOU has been signed with CMC Academy Pvt. Ltd. on 6th February 2014 for the benefits of Training for students and Faculty. MOU has been signed with Vee Eee Technologies on 16th December 2013 for the benefits of research programmes with the collaboration of Research and Development Units. Along with the Central library of the University, the ECE department has got separate library, where various different subject books of ECE are placed. The Dept Faculties, Staff and Students can make use of this library.